Clark began his coaching career at the end of his 1991 professional Cyclo cross season. A competitive cyclist since the age of 15, Clark spent over ten years competing at the Pro level. Clark represented the USA at 7 cyclo cross World Championships and 2 mountain bike World Championships. He earned a total of 10 National Championship medals (5G, 4S & 1B) before turning his attention to the development of other athletes. Over the past thirteen years Clark has amassed an impressive coaching resume. 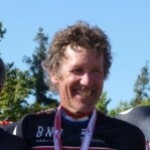 He was the USA Cycling National cyclo cross team coach from 1991 – 1999. He has also served as a coach for the USA Olympic training center and the USA Cycling National mountain bike team. As a coach, Clark has guided athletes to many successes including national titles. Clark holds a USA Cycling category 1 level coaching license. Clark continues to learn additional cycling performance coaching knowledge though peers and institutional education, his athletes and sport science of physiology. Clark athletes/clients are of all fitness and skill levels. He’s passionate about the sport of cycling and loves to see his athletes be successful.